To describe a new surgical technique for the treatment of complete third nerve palsy. This study included patients with chronic complete third nerve palsy. The lateral rectus muscle was split, followed by disinsertion of the superior and inferior halves, which were passed between the sclera and superior and inferior rectus muscles, respectively. Then the medial rectus muscle was sutured as posteriorly as possible from its insertion and cut. Next, the distal stump of the medial rectus muscle was split into two halves and united with the superior and inferior halves of the lateral rectus muscle. Finally, the proximal portion of the medial rectus muscle was sutured back to its original insertion. In cases with hypotropia and a functional superior oblique muscle, superior oblique tenectomy was also performed. Success was defined as postoperative horizontal deviation of 10 prism diopters (PD) or less and vertical deviation of 5 PD or less. Ten patients with a mean age of 32.4 ± 18.4 years had surgery using this technique; 2 of them had a history of strabismus surgery. Mean exotropia was 84 ± 14.9 PD, which reduced to 6.5 ± 8.2 PD. Mean vertical deviation was 16.5 ± 10 PD, which reduced to 2.5 ± 3.5 PD. Mean follow-up was 13.2 ± 7.9 months, and the success rate was 70% and 90% for horizontal and vertical deviations, respectively. The lateral rectus–medial rectus union technique is an effective and long-lasting procedure to overcome large-angle exotropia associated with complete third nerve palsy. This method can also be employed as a reoperation procedure. We present a new technique for split muscle medial transposition of the lateral rectus muscle plus union with the distal split stump of the medial rectus muscle together with a large resection of the proximal stump of the medial rectus muscle. Advantages of this method are increasing the length of the contracted lateral rectus muscle by the addition of the distal stump of the medial rectus muscle and transposing the lateral rectus muscle to the optimal fulcrum for producing effective adduction. This prospective interventional case series was performed at Labbafinejad Medical Center, which is affiliated with Shahid Beheshti University of Medical Sciences, Tehran, Iran. The study was approved by the scientific and ethics committees of the Ophthalmic Research Center and informed consent was obtained from all patients or their guardians. All patients with complete third nerve palsy and total medial rectus palsy who were referred to this center from August 2015 to January 2018 and had a stable angle of deviation for at least 1 year were enrolled in the study. Complete paralysis of the medial rectus muscle was confirmed by the force generation test. Patients with any degree of force generation in the medial rectus muscle or a treatable brain lesion were excluded from the study. We did not exclude cases who had a history of previous strabismus surgery for third nerve palsy. Ophthalmic examinations included evaluation of best corrected visual acuity (BCVA), refraction, slit-lamp examination, funduscopy, and measurement of deviation in primary position at distance using the modified Krimsky method. The forced duction test was performed for evaluation of possible restriction of the lateral rectus muscle. Ductions and versions were evaluated before surgery. Duction limitations were classified from −8 to 0 (eg, in the case of adduction: −8 was denoted to an eye fixed in extreme lateral gaze, −7 for 25% adduction to midline, −6 for 50% adduction to midline, −5 for 75% adduction to midline, −4 for adduction to midline, −3 for 25% adduction from midline to the medial canthus, −2 for 50% adduction from midline to the medial canthus, −1 for 75% adduction from midline to the medial canthus, and 0 for full normal adduction) (Figure 1). All measurements were performed by the first author (AB) before and after surgery in an unmasked fashion. Schematic representation for grading adduction limitation in the right eye. All patients were operated on under general anesthesia. After performing a 360º peritomy (Figure 2A), the lateral rectus muscle was grasped and dissected from the surrounding tissues and split with a small hook into two equal parts as posteriorly as possible, (25 to 30 mm) (Figure 2B). Each of the two parts was sutured separately using 6-0 Vicryl sutures (Ethicon, Inc., Somerville, NJ) and cut from the sclera. The superior half was passed between the superior rectus muscle and sclera and the inferior half was passed between the inferior rectus muscle and sclera (Figure 2C). Then the medial rectus muscle was grasped and sutured as posteriorly as possible and this part was measured and cut (Figure 2C). Next, the distal stump of the medial rectus muscle, which was still attached to its insertion, was split into two equal halves longitudinally (Figure 2D). The superior and inferior halves of the split lateral rectus muscle were united to the superior and inferior halves of split medial rectus stump using Vicryl while the globe was pulled into adduction (Figure 2E). Finally, the proximal part of the medial rectus muscle was sutured back to its original insertion (Figure 2F). In cases with a functional superior oblique muscle and hypotropia, 8- to 10-mm nasal superior oblique tenectomy was added to the operation. Schematic figure of lateral rectus–medial rectus union surgery in the right eye. At the end of the procedure, the conjunctiva was repaired. Because of the long-lasting exotropic position of the eye, the lateral conjunctiva was repaired in 8- to 10-mm recessed position and the nasal conjunctiva was resected by 8 to 10 mm. Finally, the globe was fixed to the medial nasal skin with 5-0 Mersilene traction sutures (Ethicon, Inc.) for 1 day. All eye examinations were repeated in all patients 1 day, 4 weeks, and 3 months after the operation and every 3 months thereafter. Changes in primary deviation 3 months after surgery and at last examination were compared with measurements before the operation. Success was defined as horizontal deviation of 10 prism diopters (PD) or less and vertical deviation 5 PD or less. The correlation between changes in motility limitations and the amount of medial rectus resection with success were also evaluated. Three months following strabismus surgery, if the patient had good Bell's reflex and a normal lacrimal lake and corneal sensation, we performed ptosis surgery according to levator function. If the above mentioned indices were abnormal, we prescribed crutch glasses to open the visual axis at daytime. We used mean, standard deviation, mode, and range for reporting findings. For evaluation of changes of study parameters before and after surgery, we used the paired t and Fisher exact tests. To evaluate the relationship of certain parameters with success, we used linear regression analysis. P values less than .05 were considered statistically significant. All analyses were performed using SPSS software (version 25; IBM Corporation, Armonk, NY). Ten eyes of 10 patients (7 male and 3 female, mean age: 32.4 ± 18.4 years [range: 7 to 59 years]) who had complete third nerve palsy were enrolled. Mean BCVA was 0.52 ± 0.46 and 0.02 ± 0.03 logarithm of the minimum angle of resolution (logMAR) in the affected and unaffected fellow eyes, respectively. The paralysis involved the right eye in 5 patients and the left eye in the 5 other patients. Third nerve palsy had various etiologies and 2 patients had a history of previous unsuccessful strabismus surgery (Table 1). Mean time from onset of paralysis to surgery was 6.5 ± 8.7 years (range: 1.5 to 28 years) and mean follow-up duration was 13.2 ± 7.9 months (range: 5.1 to 29.6 months). The main complaint in all patients was cosmetic concerns and most of them did not report diplopia because of the large angle of deviation and ptosis in the affected eye, in addition to low vision secondary to amblyopia or optic atrophy. Sensory and torsional evaluation was not feasible in these cases. The mean amount of exotropia before surgery was 84 ± 14.9 PD (range: 45 to 100 PD), which was decreased to 6 ± 8.4 PD (range: 0 to 20 PD) at 3 months (P < .001) and to 6.5 ± 8.2 PD (range: 0 to 20 PD) at final follow-up (P < .001). Mean amount of exodrift from 3 months to final follow-up visit was only 1.7 ± 3.5 PD (range: 0 to 5 PD) (P = 1.00). Mean correction of exotropia was 78 ± 15.3 PD (range: 45 to 90 PD) at 3 months and 77.2 ± 15.9 PD (range: 45 to 90 PD) at final examination. 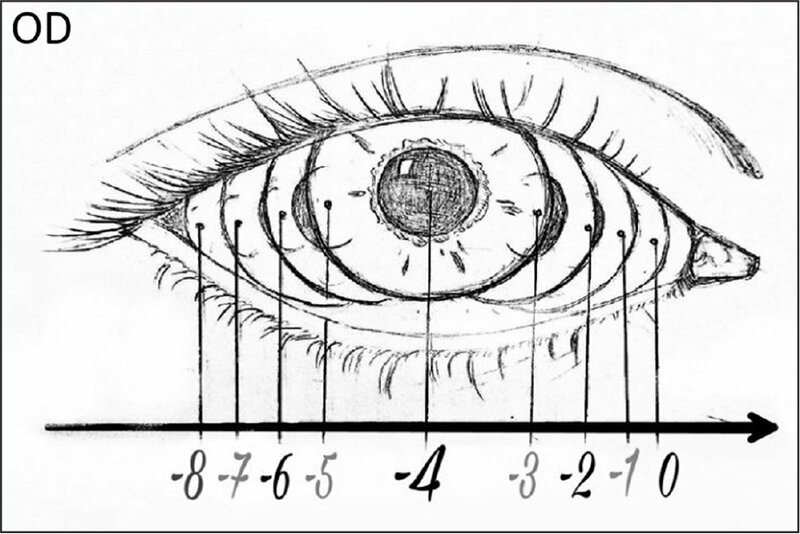 Mean vertical deviation before surgery was 16.5 ± 10 PD (range: 5 PD of hypertropia to 30 PD of hypotropia), which was reduced to 3 ± 4.8 PD (range: 5 PD of hypertropia to 15 PD of hypotropia) at 3 months (P = .001) and to 2.5 ± 3.5 PD (range: 5 PD of hypertropia to 10 PD of hypotropia) at final follow-up visit (P = .001). Mean correction for vertical deviation in all cases was 13.5 ± 8.5 PD (range: 0 to 20 PD). In 6 eyes with a functional superior oblique and hypotropia, by adding superior oblique tenectomy, vertical deviation was decreased from 22.5 ± 5.2 PD (range: 15 to 30 PD) to 4.2 ± 5.9 PD (range: 0 to 15 PD) (P < .001). Mean correction of vertical deviation in these 6 cases was 18.3 ± 2.6 PD (range: 15 to 20 PD). The overall success rate for this technique was 70% for horizontal deviations and 90% for vertical deviations. Two patients (cases 1 and 10) required reoperations: patient 1 underwent inferior rectus marginal myotomy because of 15 PD of residual hypotropia, which improved to 10 PD of hypotropia; and patient 10 underwent medial rectus re-resection (10 mm) because of 20 PD of residual exotropia and diplopia, which improved to 10 PD of exotropia. Cases 3 and 7 also had residual exotropia of 20 PD but declined to undergo reoperation because of low vision in the eyes undergoing surgery and acceptable appearance. Limitation of adduction improved in all patients and all cases demonstrated some degree of abduction deterioration after surgery (Table 1). Mean improvement in adduction was +2.9 ± 1.3 (range: +2 to +5) (P < .001) and mean abduction deterioration was −1.8 ± 0.8 (range: −1 to −3) (P < .001). The improvement in adduction and the reduction in abduction after surgery were more marked, with a statistical trend (P = .09) in patients with a successful outcome compared to those who experienced failure. 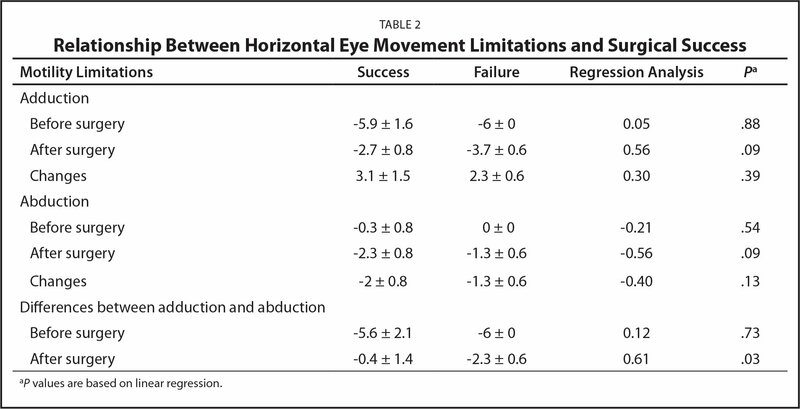 Smaller amounts of differences between adduction and abduction limitation (ie, a greater balance in horizontal movements) were significantly associated with success (r = 0.61, P = .03, Table 2). The amount of medial rectus resection was larger in patients who had a successful operation (13 ± 2.2 vs 12 ± 2 mm) compared to those who did not, but this relationship was not statistically significant (r = 0.25, P = .48). Elevation limitation improved from −3.7 ± 1.2 (range: −1 to −5) to −3.2 ± 1 (range: −1 to −5) (P = .06) and depression limitation improved from −3.9 ± 0.9 (range: −2 to −5) to −3.6 ± 0.8 (range: −2 to −5) (P = .08). Forced duction test results for adduction were positive in all cases and became negative at the end of the surgery. We encountered no major intraoperative or postoperative complication, including hemorrhage, damage to vortex veins, choroidal effusion, and anterior segment ischemia. Three months after strabismus surgery, ptosis correction was performed in 3 cases (one case of levator resection and two frontalis sling procedures) (Table 1). Figures 3–4 show two patients before and after the operation. Ocular primary position and motility in patient 1 before and after surgery. Ocular primary position and motility in patient 8 before and after surgery. This report presents a sizeable series of patients with complete third nerve palsy undergoing transposition of a split lateral rectus muscle and union with the split stump of the medial rectus muscle who experienced significant improvement and were stable with relatively long-term follow-up. Medial transposition of the lateral rectus muscle for treatment of exotropia due to third nerve palsy was first described by Taylor in 1989.23 He transposed the full lateral rectus muscle to the superonasal quadrant between the medial and superior recti muscles; the exotropia and hypotropia in his case improved by 25° and 5°, respectively. Morad and Nemet25 added superior oblique tenectomy and medial rectus resection in the same session to this type of surgery and also transposed the lateral rectus muscle to the superior pole of the medial rectus muscle and obtained orthophoria in a case of mixed third and fourth nerve palsy. Yu and Choi33 disinserted both medial recti muscles of five adult cats to mimic bilateral third nerve palsy and produced mean exotropia of 47.6 PD. The authors transposed the full lateral rectus muscle to above and back of the medial rectus muscle unilaterally and reported a mean improvement of 36.6 PD in the induced exotropia. In all of the above mentioned reports, the lateral rectus muscle was transposed between the superior rectus muscle and sclera. Gräf and Lorenz24 transposed this muscle between the inferior rectus muscle and sclera and concluded that this procedure is more appropriate for cases of third nerve palsy who have hypertropia instead of hypotropia. Full tendon transposition of the lateral rectus to the medial quadrants can induce vertical deviation in eyes that are vertically aligned, in addition to causing cyclodeviation. This was shown by Gräf and Lorenz24; in addition to induced hypotropia, incyclotorsion increased after surgery and the patients showed depression with abduction effort. In 1991, Kaufmann26 was the first surgeon who transposed a split lateral rectus muscle between the superior rectus muscle, inferior rectus muscle, and sclera in two cases of third nerve palsy associated with fourth nerve palsy. He sutured these halves 20 mm posterior to the nasal limbus near the vortex veins, and reported 15° to 20° of improvement in exotropia. The reported cases had significant residual exotropia. Gokyigit et al.27 modified Kaufmann's method by passing the halves of the split lateral rectus muscle under the superior rectus and superior oblique complex superiorly, and under the inferior rectus and inferior oblique muscles inferiorly, followed by suturing the two halves of the lateral rectus muscle 1 mm posterior to the insertion of the medial rectus muscle at its superior and inferior poles. Although this procedure improved the correcting effect of the surgery on horizontal deviation, they reported undercorrection in half of their cases. Erbagci et al.30 recently modified the Gokyigit method by simply passing halves of the split lateral rectus muscle under the superior and inferior recti muscle. They reported undercorrection in 2 of 6 of their cases, who needed additional medial rectus resection or contralateral lateral rectus recession in another session. The results of the above-mentioned studies demonstrate that when the lateral rectus muscle halves are transposed closer to the medial rectus insertion, the adducting effect is augmented and exotropia correction is improved. On the other hand, with long-standing third nerve palsy, the lateral rectus muscle is short and restricted, and transposing its halves a long distance to the medial rectus muscle is difficult and sometimes impossible. This has led some authors to employ hang-back sutures to increase the length of the transposed split lateral rectus muscle25,27 or to displace these halves more posteriorly.27 Shah et al.28 could not finish surgery in 2 of 6 patients because of severe fibrosis of a previously operated lateral rectus muscle. Most of the limitations of previous methods are addressed with our technique. We used the split distal stump of the medial rectus muscle to add to the length of split halves of the transposed lateral rectus muscle; this modification allowed us to perform this procedure successfully, even in cases with history of lateral rectus recession and consequently a much more restricted muscle (cases 2 and 6). To increase the adduction effect of surgery, Saxena et al.29 added posterior fixation sutures to the split halves of the lateral rectus muscle 8 mm posterior to their new insertion sites, which was not possible in some of their cases. With our method, a better balance between adduction and abduction was more easily obtainable. Chaudhuri and Demer32 employed high-resolution magnetic resonance imaging of the orbit in a case of bilateral third and fourth nerve palsy and showed that, despite medial transposition of a split lateral rectus muscle, the position of its pulley as the functional origin of the muscle did not change and concluded that this is the cause of undercorrection and exodrift after surgery. With the technique described herein, exodrift did not occur with long-term follow-up. We believe achieving a better balance between adduction and abduction guarantees long-term results. We observed that in patients with successful results, the difference between adduction and abduction at long-term follow-up was less than in cases with unsuccessful results. The most significant complication of this type of surgery is undercorrection and, even in the studies employing adjustable sutures, undercorrection was one of the greatest complications.28 In the current series, we did not adjust the operation and not only resected the medial rectus muscle as much as possible, but also used scleral traction sutures to fixate the globe nasally for 24 hours. This means all forces were employed to adduct the eye, resulting in a 70% success rate for correction of horizontal deviation with long-term follow-up in our cases. Considering the limited range of vertical fusion, correcting vertical deviation is important. Shah et al.28 tried to do so by adjusting the tension of the two halves of the split lateral rectus muscle intraoperatively to modulate vertical alignment. Gokyigit et al.27 reported 3.7 PD correction of vertical deviation by pure medial transposition of a split lateral rectus muscle. Overall, mean vertical correction in our series was 13.5 PD. Hypotropia is often prominent in most cases with a functional superior oblique muscle, as evidenced in our series by a mean hypotropia of 22.5 PD in such cases. We added superior oblique tenectomy to the operation in these patients and observed an 18.3 PD mean decrease in hypotropia. We believe that because the two split halves of the lateral rectus muscle envelope the globe like a belt, this technique may tune the vertical deviation by nature. One of the interesting findings of this study was the improvement in elevation and depression in addition to improved adduction in all cases, which has not been reported in similar studies. We think that this may be due to putting the globe in a better primary position, allowing the elevating and depressing force vectors to exert their full residual power. In addition, because the globe is not fixed to the orbit with this method, the dynamic balance among residual muscle powers may be another cause of this observation. Certain complications reported in previous studies were not encountered in our series. Shah et al.28 reported choroidal effusion, which may be caused by pressure on vortex veins. Methods of extreme lateral rectus muscle weakening16 tend to increase exophthalmos of the paretic eye; however, the current method anchors the eye and none of our patients complained of worsening exophthalmos. One should note that, with this method, the sequence of actions during the operation must be precisely followed for the procedure to be successful and this requires a long learning curve. It is also predictable that reoperation may be difficult after this procedure; however, we did perform reoperation in two of our cases successfully. One limitation of all types of surgeries for correction of strabismus associated with complete third nerve palsy is the inability to address aesthetics by ptosis surgery in most cases; in our study, we could add ptosis correction in only 30% of cases. Another limitation of this study is the small sample size requiring further evaluation to show its efficacy and safety. Transposition and union of a split lateral rectus muscle with the stump of a resected medial rectus muscle, together with superior oblique tenectomy in hypotropic cases, is a dynamic procedure that improves alignment in primary position and can help balance ocular movements in a paralytic eye. This technique can be used as a reoperation procedure and in children without using any autogenous or exogenous material. von Noorden GK, Campos EC. Paralitic strabismus. In: von Noorden GK, Campos EC, eds. Binocular Vision and Ocular Motility: Theory of Management of Strabismus, 6th ed. St Louis: Mosby; 2002:414–457. Helveston E. Muscle transposition procedures. Surv Ophthalmol. 1971;16:92–97. Brooks SE, Olitsky SE, deB Ribeiro G. Augmented Hummelsheim procedure for paralytic strabismus. J Pediatr Ophthalmol Strabismus. 2000;37:189–195. Metz HS. 20th annual Frank Costenbader Lecture: muscle transposition surgery. J Pediatr Ophthalmol Strabismus. 1993;30:346–353. Salazar-León JA, Ramírez-Ortíz MA, Salas-Vargas M. The surgical correction of paralytic strabismus using fascia lata. J Pediatr Ophthalmol Strabismus. 1998;35:27–32. Erratum in: J Pediatr Ophthalmol Strabismus. 1998;35:269. Villaseñor Solares J, Riemann BI, Romanelli Zuazo AC, Riemann CD. Ocular fixation to nasal periosteum with a superior oblique tendon in patients with third nerve palsy. J Pediatr Ophthalmol Strabismus. 2000;37:260–265. Bicas HE. 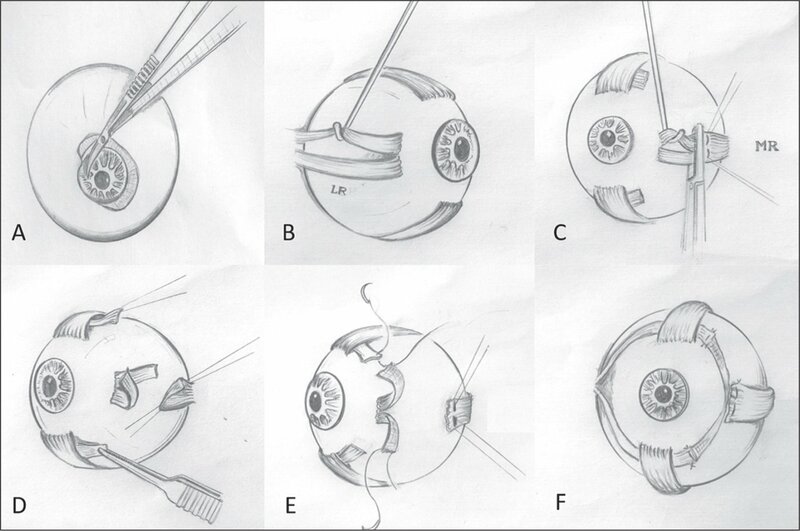 A surgically implanted elastic band to restore paralyzed ocular rotations. J Pediatr Ophthalmol Strabismus. 1991;28:10–13. Metz H, Yee D. Third nerve palsy: superior oblique transposition surgery. Ann Ophthalmol. 1973;5:215–218. Bagheri A, Borhani M, Tavakoli M, Salehirad S. Clinical features and outcomes of strabismus treatment in third cranial nerve palsy during a 10-year period. J Ophthalmic Vis Res. 2014;9:343–349. Kaufmann H. “Lateralis splitting” in total oculomotor paralysis with trochlear nerve paralysis [article in German]. Fortschr Ophthalmol. 1991;88:314–316. From the Ocular Tissue Engineering Research Center and Ophthalmic Research Center, Shahid Beheshti University of Medical Sciences, Tehran, Iran.